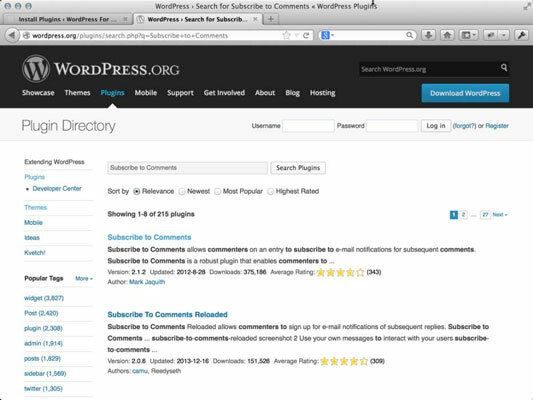 The following directions show you how to find, upload, and install the very popular Subscribe to Comments WordPress plugin, developed by Mark Jaquith. The following example uses the Subscribe to Comments plugin to take you through the mechanics involved in downloading, unpacking, uploading, activating, and using a plugin in WordPress. Subscribe to Comments gives your readers the opportunity to subscribe to individual comment threads on your site so that they receive a notification, via e-mail, when a new comment has been left on the comment thread (or blog post) that they have subscribed to. This plugin helps keep lively discussions active in your blog. Installing the Subscribe to Comments plugin takes you through the process, but keep in mind every plugin is different. Reading the description and installation instructions for each plugin you want to install is very important. The first step in using plugins is locating the one you want to install. The absolute best place to find WordPress plugins is the official WordPress Plugins Directory where you will currently find over 21,000 plugins available for download. Go to the official WordPress Plugin Directory. In the search box at the top of the Plugin Directory home page, enter the keywords Subscribe to Comments and then click the Search Plugins button. Locate the Subscribe to Comments plugin on the search results page and click the plugin name. Download Version: This is the download link that you click to download the plugin, and the number shown in this area is the most recent version number of the plugin. Requires: This tells you what version of WordPress you need to successfully use this plugin. 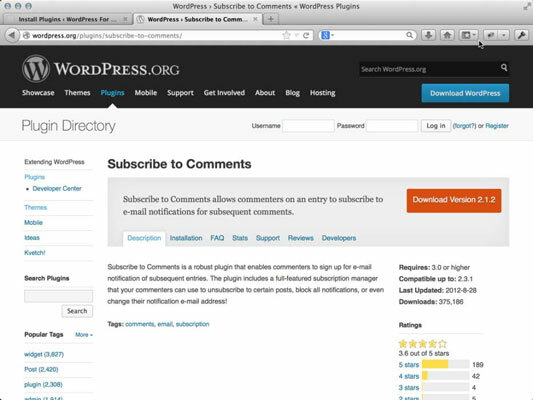 For example, the Subscribe to Comments plugin requires WordPress version 3.0 or higher; this means that this plugin doesn’t work with WordPress versions lower than 3.0. Helpful! Compatible Up To: This tells you what version of WordPress this plugin is compatible up to. For example, if this section tells you that the plugin is compatible up to version 2.3, this means that you usually can’t use the plugin with versions higher than 2.3. The best way to check is to download the plugin, install it, and see whether it works! Last Updated: This displays the date that the plugin was last updated by the author. Downloads: This number tells you how many times this plugin has been downloaded by other WordPress users. Ratings: With a rating system of 1-5 stars (1 being the lowest, 5 being the highest), you can see how other WordPress users have rated this plugin. Click the Download button for the plugin version you want to download. If you’re using Internet Explorer, click the Download button, and a dialog box opens, asking whether you want to open or save the file. Click Save to save the zip file to your hard drive, and remember where you saved it. If you’re using Mozilla Firefox, click the Download button, and a dialog box opens, asking what Firefox should do with the file. Select the Save File radio button and then click OK to save it to your hard drive. Again, remember where you saved it. For other browsers, follow the download instructions in the corresponding dialog box. Locate the file on your hard drive and open it with your favorite decompression program. If you’re unsure how to use your decompression program, refer to the documentation available with the program. Unpack (decompress) the plugin files you downloaded for the Subscribe to Comments plugin. Frequently, the plugin developer includes a readme file inside the zip file. Do what the title of the file says: Read it. Often, it contains the exact documentation and instructions that you will find on the plugin developer’s page. Make sure that you read the instructions carefully and follow them correctly. Ninety-nine percent of WordPress plugins have great documentation and instructions from the plugin developer. If you don’t follow the instructions correctly, the best scenario is that the plugin just doesn’t work on your blog. At worst, the plugin creates all sorts of ugly errors, requiring you to start the plugin installation over from step one. You can open readme.txt files in any text-editor program, such as Notepad or WordPad on a PC, or TextEdit on a Mac. In the case of Mark Jaquith’s Subscribe to Comments plugin, the readme.txt file contains instructions on how to upload and use the plugin, as well as some answers to frequently asked questions on troubleshooting the installation and use. Every plugin is different in terms of where the plugin files are uploaded and what configurations and setup are necessary to make the plugin work on your site. Read the installation instructions very carefully and follow those instructions to the letter to install the plugin correctly on your site.